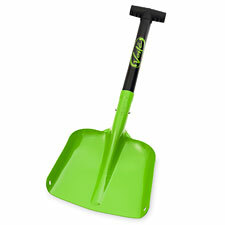 Voile has updated its smallest shovel, the XLM. The original XLM was arguably the lightest functional aluminum avalanche shovel on the market. The new XLM is...arguably the lightest functional aluminum avalanche shovel on the market. What's changed? Voile says the new XLM is lighter, which conflicts a bit with my 2007 notes (I think the first-run XLM shovels were lighter still, but subsequently became heavier). What is clear is that the blade is a little smaller, which actually does address one of the things I found most annoying about the 1st-generation XLM. If I'm carrying a shovel in this class it's because I want the smallest, lightest aluminum shovel I can find. It's likely I'm not expecting to do a lot of digging with a shovel like this, either around camp or in rescue scenarios, but if I am going to be digging I want the shovel to be durable and effective. For this need, the Voile XLM is a perfect choice. It comes in 0.5 ounces lighter than my Backcountry Access Tour shovel (which can't hurt when I'm chasing my speedy partners), and in various tests I've seen, the Voile's perform very well when it comes to strength and durability. To get lighter and smaller than this, you've pretty much got to switch to plastic specialty shovels, such as race models, which really aren't suitable for real-world (ie, emergency) use. Compared to the original XLM, the new one fits a little easier in a daypack thanks to its slightly narrower blade. Note that the XLM does not have a telescoping handle; it is removable but the length is fixed. I find the grip comfortable in-hand, and the shovel blade is smooth enough for basic pit-digging needs. A lot of stores are still selling the older blue version of the XLM. To be sure you're getting the 2012 model, go green.